If you often find yourself saying “If I only had enough money to …” or “I wish we had their income so we could take a nice vacation,” you aren’t alone. It’s tough to find contentment when you’re constantly thinking about what you’d like to have. But one way to view your money and life differently is to focus on the blessings you have right now. 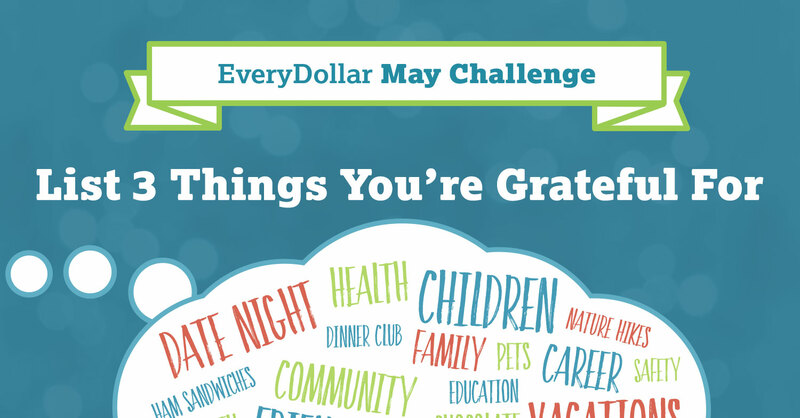 That’s our May challenge—list three things you are grateful for right now. Focus on what you currently have to be grateful for, such as positive relationships, good health, or that pint of ice cream in your freezer. Complete the three sentences below with what you value the most. I’m most grateful for ___________________. Once you are done, put the list in a place where you’ll see it often—on your refrigerator or your bathroom mirror. This is an easy way to remind yourself of your blessings! The more time you think about the awesome things you do have, the less you’ll worry about what you don’t have. Don’t get us wrong—you can be grateful and still purchase nice clothes or a new-to-you car. But don’t rely on possessions to bring happiness. It’s easy to lose sight of what makes us grateful when we shift our attention to what other people have. So here are some tips to help you focus on what you have to be thankful for! Limit your time on social media. Don’t spend all afternoon admiring those vacation pictures your friends post to Facebook and Instagram. Don’t compare yourself to others. You don’t know if a big income or big loan is the reason your neighbors have a new convertible in their driveway. Comparing your lifestyle to someone else is unfair to everyone, especially you. Watch what you watch. There’s no shortage of “reality” TV programs that show rich families visiting tropical beaches and staying in mansions every other week. The less you watch those over-the-top shows, the better. Being grateful for what you have brings a new level of peace to your life. Make May the month you choose to find contentment. It's free, priceless, and you don’t need to wait for it to be shipped to your door! Learn more about living the life you want instead of chasing someone else’s dream from #1 New York Times best-selling author Rachel Cruze. In her new book, Love Your Life, Not Theirs, she shines a spotlight on the most damaging money habit we have: comparing ourselves to others. She then unpacks six other healthy money habits for living the life we really want without being buried under debt, stress, and worry. Quit the comparisons and reframe the way you think about money. Preorder your copy today!